Apply the latest updater (Version 8.22 or later) that has been provided since July 2016 to EDIUS. 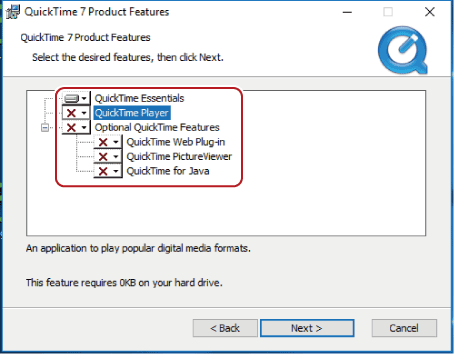 The functions are made to be available, with some exceptions, in an environment where QuickTime for Windows (hereafter referred to as QuickTime) is not installed. The updaters provided for the solution of the end of QuickTime support are only for EDIUS 8 and EDIUS 9. Visit our website for the latest updaters. For restrictions that occur after uninstallation of QuickTime, see Restrictions after Uninstallation of QuickTime . We keep working on providing solutions so that EDIUS can operate without problems after uninstallation of QuickTime. Visit our website for the latest information. 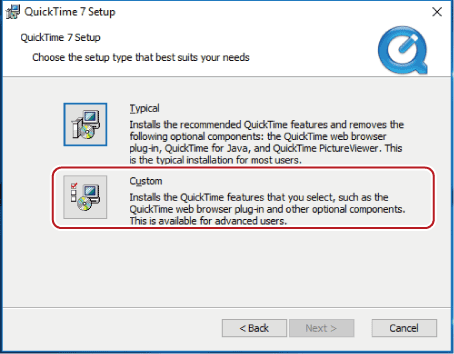 To use the features described in Restrictions after Uninstallation of QuickTime , custom installation of QuickTime is required. Download the QuickTime installer (QuickTimeInstaller.exe) from Apple website in advance. The following procedure is given as a temporary measure to minimize the vulnerability of QuickTime. Note that it does not guarantee a complete solution for any risk occurred in such a case when a malicious MOV file is opened on EDIUS. 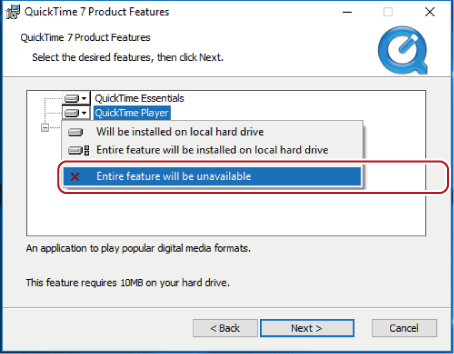 This section provides the procedure for custom installation of QuickTime for Windows 10. This step only applies when QuickTime is installed on your PC. Click the Windows logo at the lower left of the start screen to display the start menu, and click [Settings] → [Apps]. Click [QuickTime 7], click [Uninstall], and uninstall according to the on-screen instructions. Follow the on-screen instructions for installation. 3) On the [QuickTime 7 Setup] screen, click [Custom]. 4) Click [QuickTime Player], and click [Entire feature will be unavailable]. For items other than [QuickTime Essentials], confirm that the icons on the left are [×]. 5) Click [Next], and install according to the on-screen instructions. To use functions of QuickTime, from [System Settings], go to [Importer/Exporter] → [QuickTime], and check [Enable QuickTime Importer]. To enable the changes in the settings, restart EDIUS.